Stop, my friend! I am afraid – stop! between the trees on the hill, the bent trees on the hill, I saw an eye, unless that eye is a cloud. It fixes me with its troubling stare; stop! It follows our steps along the road, unless that eye is a cloud. An abandoned railway station is like an old man living alone, with its run-down buildings, its tracks covered with weeds and thistles beyond the cracked concrete of the platforms: it goes nowhere and no one ever comes. This is what Michaï told himself, his violin case under his arm, as he approached the irregular outline of the building, with its pseudo-Mittel-European air, its windows topped by crescent mosaics, its stepped roofs culminating in a terrace flanked by two gables. Above the sealed doors, the ceramic sign was still fresh and bright: CHEMIN DE FER DE CEINTURE.Rags and garbage bags littered the adjoining waste ground, like a deserted marketplace. A freight hangar stood silhouetted on a patch of lower ground, overlooking the unloading area. To either side, beyond the signal gantries and pylons, the industrial wasteland extended far and wide, dismal beneath the clouds. Michaï felt older even than his violin, a Lupot, with pegs and an end-button of ivory. The commemoration was scheduled to take place two days from now, on July 16. He was certain not to go, but the municipality’s invitation – received poste restante, on glossy paper with a reproduction of an old photograph of the station when it was still in service – had refreshed his memory. At first light, released from a vague, formless nightmare, he had taken refuge in a bar in Le Bourget, opposite that other railway station of sinister renown. Leaning his elbow on the zinc counter, he had wondered what could possibly be the use of a life’s end such as his, forgotten in the hearts of men, with no ties, no answering echo. On the television screen above the bar, he glimpsed pictures from the news: the day before, an encampment of Roma gypsies had been dismantled on waste ground in Bobigny. He had recognized the building with its gables, the freight hangar; instinctively, his violin case under his arm, he had set out for the place, two or three kilometers away. Walking was an exertion at his age, but he enjoyed making his way down the streets of small houses between the Ourcq canal and the cemetery in Pantin, with their views towards Aulnay-sous-Bois, Noisy-le-Sec, and Drancy. There was something timeless about the hidden suburbs, behind the highway off-ramps, the concrete blocks of the housing projects; on a warm day, beneath their leafy canopy, the small villas and allotments had a deceptively rustic air. The scent of lilac opened vistas of memory. He had lived in places like this, before the war, before the winter of time. Later, he had shivered constantly, even in the height of summer, teeth chattering in bright sunshine, defenceless against the icy mists of the past. 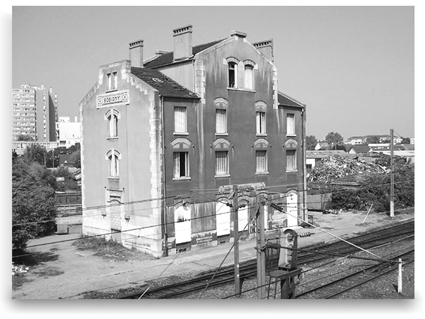 On reaching the old station in Bobigny, he remained dry-eyed, but sensed a vague commotion, unawares, like a swimmer scarcely surprised that he can no longer make headway, his legs severed by a single shark-bite. The flapping wings of cloth on the waste ground, the rusted rails among the nettles, the storm vapours blowing on the horizon, were markers for things buried far too deep. Just then, a short, hunched silhouette crossed the tracks. Michai rubbed his eyes hard, to make the image disappear. This figure, these signs, sprang from the grumbling depths of a loud, black abyss. The gnome was scampering back and forth, as if lost, between the north end of the platform and the waste ground when, suddenly, he stopped. He seemed to have spotted Michaï standing next to the main building like a traveller uncertain where to go. Michaï had come to peer over the rim of a breach in time, reopened a few hours earlier by the watery moon of a TV screen in a bar, and now, here before him, a spectre was scurrying. A closer look revealed a boy of ten or eleven, carrying a heavy bundle. Michaï could just make out his wild expression, his adult clothes cut down to size, the hunted look of a stray cat. The old man approached. With the instinct of a one-time fugitive, he showed his violin, holding it up above the cap on his head. Straight away, the kid seemed reassured. He bent forward and slid two straps across his chest, releasing the pleated fan of an accordion, with a brief whine of the bellows. Still at a distance, Michaï nodded his head. The child spoke these words in a sad voice, but with a secret, almost conspiratorial air. Now Michaï understood. Nicolaï had stepped over the brambles biting at the remains of the chain-link fence, and stood in front of him, now, his left shoulder stooping slightly under the weight of his instrument. A look of extreme anxiety, mingled with scorn, crossed his face, the skin marbled with the marks of a night spent rough, fragile but defiant – no fingerhold for pity there. The instinctive defiance expressed in his thin features was aimed at nothing and nobody. Only a slight contraction of the lips, and his reddened eyes, betrayed his state of panic. Michaï glanced along the abandoned concourse. A burnt-out camp fire between four stones, socks hanging on a line, a water container, sodden sticks of bread… The expulsion must have been speedily carried out. It was almost always the same: the local authorities would chase out the descendants of martyrs, so that their memory could be honoured in peace. “Where have you been until now?” he asked. The Roma boy jerked his chin at his accordion. Nicolaï had managed to give them the slip, he said. He had wandered for hours on the outskirts of Paris, between Porte de la Chapelle and Porte des Lilas, but hadn’t found his way back to Bobigny. During the night, as he tried to sleep on a building site, on a pile of sand, the memory of the place had come back to him. He had just arrived, now, late in the morning. But the camp had disappeared. The old man gestured to the boy. Michaï shrugged his shoulders, a sad smile playing at the corners of his mouth. “Lekh Lekha!” he muttered, between his teeth. He placed some coins in the small hand, blackened by the greasy accordion straps, then turned on his heels with a last look at the sign – CHEMIN DE FER DE CEINTURE – on the front of the building. In July 1944, he had been brought in a convoy to this station, but not for a tour around the outskirts of Paris. He must have had the same vagabond look, after a year spent hiding in livestock sheds and stables, living on the kindness of the Burgundy farmers. He had been taken in by a priest, in a church where he had hidden for that last month. He had no idea how he had ended up in a corner of the Yonne department, near Jonches, always within sight of the bell-tower of Auxerre cathedral. The round-up of July 16, 1942 was inscribed on his soul, like the death of a child… It was early in the morning, very early, on Boulevard de Ménilmontant. Barely light. Police wagons were parked everywhere, blocking the streets; dozens of gendarmes and inspectors poured into the apartment buildings. Michaï had just got out of bed, and been sent on a mission to fill a basket with sand collected from the edges of building sites or the courtyards of apartment blocks, for his cat’s litter. His sisters’ job was to find bits of fat or chicken bones for their pet, in the garbage cans of restaurants – the condition for keeping the animal at home in those hungry times. And so Michaï was able to watch the sudden deployment from behind an empty coal-seller’s cart, blackened with coal dust, at the corner of Rue des Cendriers. Hurriedly-dressed neighbours, some still in their dressing-gowns, were shoved out onto the street at the bottom of their building. In shirtsleeves, with jackets over their arms, they had been ordered out in a rush, and few were wearing their yellow stars. Holding their guns crosswise, the gendarmes rammed them towards the wagons; those who resisted were hit with rifle butts. There were anxious, terrified shouts, old women crying. Weary-looking officers separated the children and adults, beating off those who clung on, with their hats and kepis. Panic-stricken, abandoning his basket of sand, Michaï ducked through the mêlée and ran to his front door, in time to see his sisters pushed outside by plain-clothed inspectors, followed by his mother, shaking with fear, her arms laden with blankets. And last of all, his father, a half-closed suitcase clamped tight under one arm; a gendarme was twisting the other. And now, and then, more than anything else, he remembered his mother’s gaze, looking towards his sisters, and down the boulevard. She was looking for him, of course. He, Michaï. She hoped to see him, and dreaded that he might show himself. His sisters were torn abruptly from her, dragged away towards another vehicle, a platform bus already full of people. They fell against one another. He could still see their slender silhouettes and pale faces. His father cried out to them, in a broken voice: “Don’t be afraid!” A man tried to break free of the police cordon, running off towards Belleville between the trees on the boulevard’s central island. Shots rang out in the dawn light. On Boulevard de Ménilmontant and all over the neighbourhood, and everywhere in occupied France, people from Poland, Romania or other such far-flung places were arrested, herded together, put into convoys; accented Jews, artisans, pregnant women, old folk. With a sharp, dry retort, the doors of the wagons slammed shut forever on a life of cautious happiness. It was over. He would never see them again, neither his father, nor his mother. And his slender sisters receded still, further and further in his memory, like the lines of trees on a road to the horizon. He alone had escaped the rafle du Vel’ d’hiv’, the round-up at the Winter Velodrome, thanks to a bit of sand collected before dawn for the litter of the old tom cat that had seen him enter this world. The house-cat had fled. And his sisters and mother were no more real to him now than the shapes of clouds. Sixty-seven years had passed. He still heard his father crying out to them, “Don’t be afraid!” They had all left for Auschwitz-Birkenau, via Drancy, from the station at Le Bourget. Had he not been betrayed and deported in turn, two years later, he would never have understood their fate. Michaï glanced one last time at the deserted railway lines. The Roma boy was hopping from one foot to the other, out there on the waste ground. With his accordion on one shoulder, his silhouette stood out like a hunch-backed angel or gnome against the backdrop of wasteland, girders, and factory chimneys. Slowly, his violin pushed up under his arm, Michaï wandered deep into the maze of small villas, far from the main traffic routes. The City Hall offices loomed at the foot of a cascade of irregular rooftops, a jumble of red tiles and slate. He walked up Rue de Bresse and found himself passing under the périphérique freeway. A black tunnel stinking of urine, swept by a warm gush of air, cut the daylight in two. Strangely, when he emerged at the far end, sunshine had broken through the grey cloud. Quantities of swallows babbled on the cables overhead. The azure sky was tinged coppery red. The storm rumbled in the distance. Michaï walked slowly past the fences and hedges. Rue Adam, Les Abricotiers – the streetnames spoke to him of nothing but this radiant moment of peace, in Drancy. He knew where his wanderings would lead, inevitably, as they did every year in the warm weather, but before that, he wanted to savour the moment. Wherever he went, he liked the moments just beforehand best of all, the moments with the power to save us. Clusters of blossom tumbled over a low stone wall; the brazen scent went straight to his head. How could nature be reborn each spring without the universal, crushing blast of nostalgia? Just then, he thought he heard the whine of a harmonica, and turned his eyes to the tall fences of the little houses on the opposite side. But all he saw was a cat on a concrete gate-post. A prospect of a tiny garden, with its flowerbeds and arbours, brought him back to the depths of the mystery revealed by the merest shift in his thoughts, more changeable than the breath of wind in the lilacs. “Every Jew scheduled for arrest must be taken to the primary Centre, with no unnecessary exchanges of words, and no comment.” So said a directive issued by France’s national guard, at the time of the mass round-ups. But it was the Germans, ably supported, who had finally taken the “Jewish question” in hand. Luck had been on his side until then, for no good reason – mathematical probability always lets a few ants escape the great bath of quicklime. He was betrayed too, in the end, by a bigoted pest of a woman; arrested, beaten to a pulp, and taken to the camp at Drancy, the terminus of a calamitous convoy, almost two years after his father and mother. While the Allies secured victory in the battle of Normandy, the deportations continued, in greater numbers than ever. A continuous, appalling mass transit, like sick cattle shunted to the gates of the slaughterhouse. He was one head in this vast herd of death. Then came the transfer at the station in Bobigny. The wagon doors soldered shut. Packed inside for a journey more terrible than the throes of death. Those who died of thirst or suffocation were spared the worst. After that, how to keep the memory of something no human being had ever known, anywhere? When the deportees were let out, four days and four nights later, when the sliding doors were pulled back, screeching and grumbling amid the roars of armed men in helmets, death was on every face. Everyone was made to follow the terrified herd of new arrivals between rows of barbed wire, through a landscape and sky of mud. Young people in uniform struck terrified old people with their boots, and the butts of their rifles, before emptying their magazines into a group of small children crouching in a corner. Perhaps they at least felt a measure of pity. The gas chambers were for the great mass of those who had been spared, those who had passed without too much difficulty through the first circles of Hell. Michaï paused beneath a tall gate-post, with its cat, watching the sunlight play on a bed of roses. How had he managed to escape a second time? Well-developed for his age, with broad shoulders, he had been assigned to roof repairs until exhaustion and hunger unmasked his thirteen years. Winter had come. The bombs had brought Germany to its knees. The Russians were at the gates of the crematoria. Bombers were flying over the camps. In the frenzy of the extermination lines, amid the cries of the SS and their lackeys, after a fall that left him half buried in the foul snow, he had found himself in the middle of a group of children of all ages, some with wounds to their faces and necks, their hands red. Pressed one behind the other, frozen in their filthy rags, eyes wide with the horror of the day. Pushed with them towards a group of grey buildings from which rose lines of smoke, he had time to notice the marker sewn on the shoulder of a tiny boy crying in a dull voice for help: a brown triangle. The others all wore the same. Except for him, Michaï: his was a yellow star sewn by an obliging woman at Drancy, the only star amid the triangles. Amid the chaos, the horrifying screams, the barking, he must have gotten into the wrong line, unnoticed. A baby-faced German soldier spotted him suddenly, bent over to pull at his jacket, inspected the badge and looked scandalized, as if he had found a mouse in a batch of ducklings. “Geh weg!” he yelled, throwing out his arm by way of explanation. “Du bist nicht Gypsy!” Michaï did not know it yet, but the incident saved his life, a few metres from the gas chambers. He was sent back to his own column, the Jewish children on their way to anther block, in another sector of the Lager, where other Sonderkommandos were waiting for them, under the gaze of armed sentries, a prospect offering less chance of escape than a minefield. The electrified barbed wire buzzed like a row of hives. And so what really happened next? There was a great din – exactly what, he could not tell. Machine gun fire crackled from the tops of the watchtowers. A dizzying vortex dragged the blazing corners of the world down with it. Suddenly, geysers of soil and steel opened a breach in the dust. Michaï, fists over his ears, saw figures dressed in striped uniforms pouring into it, heads lowered, running wildly. He copied them, unthinking, running straight ahead, oblivious to the volleys of automatic fire that felled the fugitives here and there. Deafened, he raced towards the fields and hills, crunching snow underfoot. What happened after that was known only in his nightly dreams. One thing was certain: his star had saved his life. Thanks to the triangles, thanks to the Roma children pushed just ahead of him into the dry showers of death. And was it not, truly, a curse of sorts? They had suffered only a single moment of horror: the horror that stayed with him always, pursuing him like his own shadow. The spring breeze carried an odour of soot. On Rue des Abricotiers, smoke rose from the chimney of a tiny bungalow. Someone who felt the cold like he did, no doubt. All the flowers of all the gardens could not hide the charnel house of his memory. Yet there had been other moments, the quiet of melancholy, encounters he had never dared hope would come his way. As much as his star, music had been his saviour. He had learned to play on Rue de la Chine, with a music master by the name of Ocholowski, an old friend of his parents who never forgave himself for surviving his own grandchildren. A very pious man before the war, and almost blind afterwards, he had given away his books and ceremonial objects, apart from the mezuzah on his doorframe, and the eternal lamp. On the major holidays, he no longer went to the synagogue, but played his fidl alone at home, and his music was more poignant than all the prayers together. One day, when Michaï turned twenty and knew all the secrets of the klezmerim, Master Ocholowski made him a gift of his most precious instrument, a Lupot with pegs and an end-button of ivory. “Now, go and get yourself hired for all the parties, if there are enough Jews left to spread a little joy!” the old man urged him, dissolving into laughter a few weeks before he was taken into hospital. His pupil had learned his lesson well: for over half a century, he played at weddings and barmitzvahs, on the feasts of Rosh Hashana or Yom Kippur, most often solo and sometimes with other klezmerim, players of the tshekal, piccolo or clarinet. But age had caught up with him; he was as old as Master Ocholowskinow, and still on the road, his Lupot under his arm, but people hardly ever called on his services. And so he sometimes played for nothing, or almost nothing, on street corners, in the towns and suburbs. Michaï resumed his distracted pilgrimage. He avoided the grim Avenue Jean-Jaurès, taking Rue Jules-Guesde, and Rue Auguste Blanqui instead. Again, he thought he heard a dull, vibrating sound, like the horn of the old platform buses. But now here he was, walking down Rue Arthur Fontaine, intersecting at right angles with Rue Blanqui, running the length of the great concrete U shape formed by the Cité de la Muette housing scheme. Just beyond its open end, level with the commemorative livestock wagon positioned like the accent of the Hebrew letter het – the eighth in the alphabet, shaped like a horseshoe – Michaï stood gazing at the enclosed space: an ordinary, residential building in an outlying dormitory district, with four floors and a hundred doorways, populated by ordinary families, a concrete block with truncated arms, facing the symbol of the deportation. Tens of thousands of hapless people had awaited their final journey here, behind windows unfinished at the time, devoid of glass, staring down into the grey dust of a municipal building site transformed into a temporary internment camp. Now children played in sandpits, mothers pushed strollers in the gardens, people could be seen laughing on the floors above. Michaï walked past the wagon and stopped at the right-hand end of the het. He took his violin from its case, put the case down on the ground, and launched into the Yiddishe Mame, playing it over and over, for his two sisters and his mother, for his father who told him over and over again not to be afraid, for the children of Birkenau, with the brown triangles. Suddenly, the vibrating sound began again behind him, rich and full this time, like the vibrant chords of an accordion bellows, in expert hands. Michaï trembled with inexpressible joy. Nicolaï was advancing towards him along the central space, working his instrument as he walked. No better accompaniment for the fidl, than an accordion! The two musicians upped the tempo, faster and faster until the children left their games, coming closer one by one; and now the old timers came too, and the mothers pushing their strollers. Coins were tossed from the windows, ringing out on the concrete walkway. The Yiddishe Mame was like all the best gypsy tunes, echoing gaily in the vast central space of the Cité de la Muette. Oy vay! ‘Tis bitter when she’s gone! Michaï smiled at the Roma boy. Nothing ages better in this world than our encounters with others. They had a road to travel, still, together. This entry was posted in Literature, Literature in translation and tagged Drancy, Holocaust stories, Hubert Haddad, klezmer, Paris, Rafle du Vel' d'Hiv.